In the old days of variety entertainers turned their hands to acting, presenting, singing and comedy and if you could do all of the above, you could be a star and this week’s subject was just that. He was the Englishman’s image of Scotland with his regular television appearances in a kilt he was known as the kilted minstrel. It was felt that he could follow in the footsteps of Harry Lauder, a Scottish comic who was immensely popular when Stewart was growing up, but he wanted more to be an actor. His comic timing and knack of being funny led one of his friends, John Cairney, to comment, “He was essentially an actor and he acted the part of a comedian.” He attended Drama College in the mid-fifties which is where he met Sheila who later became his wife. His mimicry was spotted by someone who brought it to the attention of a producer at the BBC where is got a slot doing impressions of Louis Armstrong and Bruce Forsyth on BBC Scotland. Andy recalled, “Whilst I was there I had a chance meeting with a man who said to me ‘I am starting this show called the White Heather Club but there is no room for you Andy because, although I know you can do impressions, I’m looking for someone who can do bothy ballads. '” A bothy is an outside farm building in the northeast region of Scotland where unmarried labourers used to sleep and those labourers used to sing songs. Andy continued, “I turned to him and said, well I could sing a bothy ballad to which he replied ‘go on then, sing one for me now. '” He did and it got him the job. It was his love of poetry that led him to songwriting and in 1959 he signed a recording contract with Top Rank records, his first release was Donald Where’s Your Troosers, a song Stewart had co-written with Neil Grant and the arranger Iain MacFadyen. It wasn’t a big seller spending one week on the UK chart at number 37. The follow-up, A Scottish Soldier which has the parenthesis Green Hills of Tyrol was a completely different story. The tune, which Stewart first heard on a family holiday at the Braemar Highland Games, was old but the lyrics, written by Stewart, were new and he explained how he came to write the song, “I wish I could say that it was written somewhere in tranquil solitude, but I wrote it in a pub. I had always known and loved The Green Hills of Tyrol because my father was a musician and played it on his fiddle and I remembered it from when I was knee-high to a grasshopper. It was one of the few things I could play as a boy on the mouth organ and I’d always had an ambition to write words to the tune. When I first began putting words to music, I was haunted by this tune and eventually inspiration came during rehearsals for The White Heather Club. I got an idea for the lyric for the song, it was a story about a Scottish soldier who finds himself in a far land, his soldiering days are over and the call of his own country takes him back for his final resting to Scotland. And I sat down and the words just came to me; ‘there was a soldier, a Scottish soldier.’ I wrote two verses and then I got pianist Harry Carmichael to fit the tune to my words. The next day we were doing the song and I knew it wasn’t right. It was Bobby MacLeod’s Black Band that was playing it with us and of course they didn’t need the music, they knew the tune, they just had to play the arrangement that had been set down of the tune. So I went down to one of the pubs in Springburn Road and I wrote on the back of an envelope the third verse (the slow verse) and came back and just sang the song. 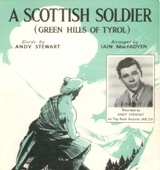 On the Andy Stewart website, there is a section called The untold story which states, The popular romantic idea of the Scottish soldier defending his beloved Scotland – patriotic to the end, and the notion of the tune being an old Scottish traditional, were actually far from the truth behind the origins of A Scottish Soldier. The tune, The Green Hills of Tyrol, a well-known ‘Scottish’ melody was transcribed for the pipes by Pipe-Major John MacLeod of the 93rd Sutherland Highlanders during the Crimean War (1853-56) from the third act of Rossini’s 1829 opera William Tell. Rossini in-turn had adapted that tune from Alpine folk music – nothing at all to do with Scotland. However that did not stop Andy receiving a backlash from traditionalists who wrote to him saying he had ruined a ‘fine old Scottish pipe tune’ by putting words to it. The theme of the dying soldier, wishing to return to the hills of home rather than die in a foreign country is not a straightforwardly sentimental one. The soldier Andy was imagining was far away from home for reasons of monetary gain, war being to him a lucrative business, defending those who rewarded him well. Although there may have been battles glorious and deeds victorious, when the bugle ceases the underlying story is not one of patriotic heroism. By the mid-eighties, Stewart’s health wasn’t in good shape; he had two heart by-pass operations and for a man in his fifties he began to look a lot older. His doctor advised him to take things easy at which point Stewart decided to set off on an Australian tour. He did say “I would need a psychiatrist to tell me just why I carry on.” He was set to appear in a Pride of the Clyde variety-revue at the Pavilion Theatre in Glasgow in October 1993 but died of a heart attack just before at the age of 59. A Scottish Soldier spent a staggering 40 weeks on the UK chart but climbed no higher than number 19, but did chart in the US and made the top five in Canada, Australia, New Zealand and, surprisingly, India.